It’s October once again, and with that I continue my history of horror. I covered all of the 1915 episodes of “Les Vampires” last year at this time, and so now I continue with the episodes released in 1916. Strictly speaking, this isn’t a horror film, since the vampires in it are just a gang of ordinary master criminals, but since the imagery and atmosphere has been influential in the horror genre since then, I include it for consideration at this time of year. Hang on to your hats, as usual the plot is ridiculously complex! This episode begins by introducing us to yet another of the alter-egos of the Grand Vampire (Jean Aymé), a successful real estate agent by the name of Treps. One day a new client, a businessman named Juan-José Moréno (Fernand Herrmann), comes to his office and requests an apartment with a safe. 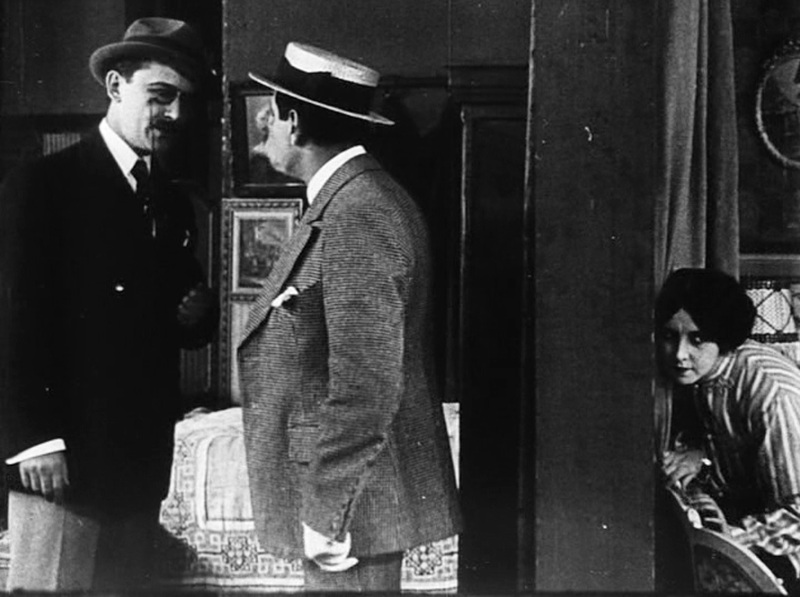 This arouses Treps’s greed, and he and Irma Vep (Musidora) break into the safe by way of a connecting door in the wall from the adjoining apartment. All they find, however, is a satchel full of the same type of black costume the vampires use during criminal activities. They conclude that he is a “colleague” and put the satchel back. Musidora is meanwhile working for a bank under the alias of Juliet Berteaux. She learns of an upcoming transfer of 300,000 francs to be carried out by a “carefree” man named Metadier who likes to watch Gaumont films in the evenings. However, should Metadier be unable to perform his duties, she will be the substitute. So, she and the Grand Vampire attack Metadier on the train on the way home from the movies and kill him with a hatpin, dumping his body from the moving train. The next day, as she goes to get the money, suddenly the “specter” of Metadier walks in and takes it! The Grand Vampire follows him, but he escapes down a manhole. 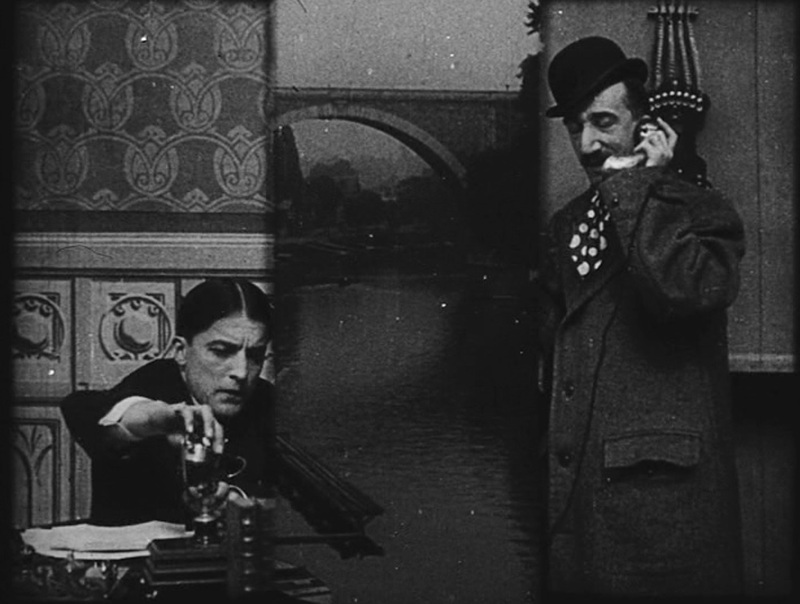 When the intrepid but largely ineffectual Philipe Guérande (Edouard Mathé) learns of the theft, he goes to the bank office in disguise and recognizes Musidora. He is able to learn her alias and address, and has his agent Mazamette (Marcel Lévesque) distract the maid so that he can sneak in. Musidora and the Grand Vampire, saddened at their failed heist, decide to look in Moréno’s safe to see if he’s had any success. They are startled when the body of Metadier falls out and even more surprised to find the 300,000 francs! Guérande now arrives and tries to take them captive, but of course the maid hits him on the head and they easily escape with the money. He wakes up and calls the police just before Moréno returns to find his safe broken into. Guérande holds Moréno and learns the true story: he was casing a villa for a robbery when he found the body of Metadier on the tracks, and found the note authorizing him to take the money. He then took the corpse home with him, disguised himself as Metadier and stole the envelope. Guérande hands him over to the police. Once again, the plot advances with no obvious resolution in sight: the Vampires killed a man and bungled a job, but still wound up with the money and Guérande is no closer to apprehending them. I liked this episode, though, because we got a lot of Musidora and not too much Guérande, although there wasn’t enough Mazamette for my taste. My usual logical criticism of the plot: it seems like the Vampires have to spend an awful lot of time working straight jobs in order to arrange their devious crimes. How exactly does one become a “successful real estate agent” when one only has a few days a month not wearing some other disguise? I think director Louis Feuillade handles the pacing and story complexity well. I’ve read some criticism recently that claims Feuillade always edited sequentially and never made use of inter-cutting between scenes. While that may be technically true, he does use cross-cutting here to show simultaneous actions in the adjoining apartments (maybe this could be seen as a single scene), and there’s good use of close-ups, location shots in Paris, and establishing shots that set up interiors. Also, he uses his triple-split-screen effect again to demonstrate a phone conversation, as he did in “The Dwarf.” Watching a Feuillade crime serial feels sort of like coming home: I more or less re-started this project when I watched “Fantômas” in 2014.